This is one of Johansen's earlier titles. 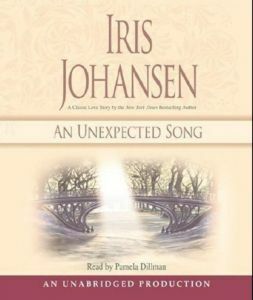 Like Sandra Brown's earlier work, I find these category romances by Johansen not able to stand up to her more recent work, yet sometimes I need something lite and these short pieces work. This title actually surprised me. Daisy Justine is a talented singer/actress that is living in a remote town in Europe when Eric Hayes discovers her and convinces his brother Jason to travel away from his Connecticut estate to listen to her perform. Eric is convinced that she would be perfect for the new musical they are producing. Daisy though is not so convinced since she has decided to stay close to her ailing father who is suffering from a rare disease and has little time left. Jason Hayes is a bit of a cynic. His life has made him a bit rough around the edges but when he hears Daisy sing he is enchanted. When she refuses to join the production he is even more intrigued since his work is renowned and to have her shoot down this opportunity has him curious. No one will do for the main character to his musical except her and he sets out to conquer her and his rampant desire for her. At first I really disliked Jason. Found him to be very arrogant and brash with a side of manipulator (playing on her desires to get her into bed). But he really grew on me by overcoming his fear to love. He never came out and told Daisy he loved her but after getting the whole picture we can see by his actions his deep love for her. Yet his reasons for isolating himself were a bit far fetched since his reputation and clout should have given him the leverage to put that situation to rest, but I guess Johansen had to rely on some type of plot twist to separate our lovers. Daisy showed herself to be a bit weak at first, giving into anything a man said but she became a strong character toward the end. Don't get me wrong, she was never annoyingly like a doormat, which is usually the case with weak heroines but she seemed to take everything at face value and lets herself fall into situations that were a bit bizarre (agreeing to Jason's demands of evening meetings for example). The writing was good enough to keep me engaged but the passage of time was not clear enough to avoid confusion. What appeared to be a day in the lives of our characters, at times, turned out to be weeks which caused the confusion that I mentioned and had me readjusting my perspective in many scenes. The book was a nice short read that gave me more than I expected. Guess I wont be reading that one! LOL! Hey! I think you missed my last comment: "The book was a nice short read that gave me more than I expected." I guess I had low expectations when I started. LOL!